Pork and beef meatballs with trulli pasta in our tomato sauce, topped off with mozzarella. This recipe is made with some raw ingredients and isn't suitable for microwaving, so please follow these cooking instructions carefully.1. Preheat your oven to 200°C/180°C fan/ gas mark 7. (Be careful not to grill by mistake!)2. 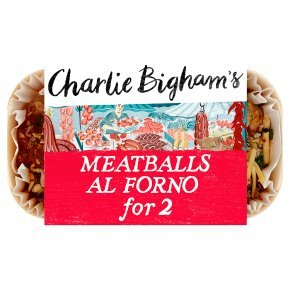 Remove the film but leave the meatballs al forno in their wooden tray*. Place on a baking tray in the centre of the oven and cook for 35 minutes.3. Leave to stand for 2 minutes before serving. Make sure it's piping hot throughout. *Our wooden trays are designed for the oven. Just make sure they aren't placed close to any element or flame.